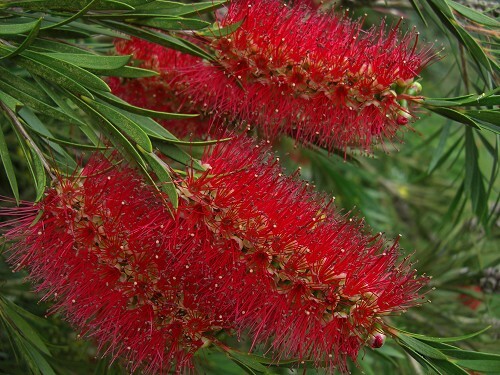 Callistemon is an evergreen shrub that was originally introduced from Australia but some species grow quite successfully in Britain. 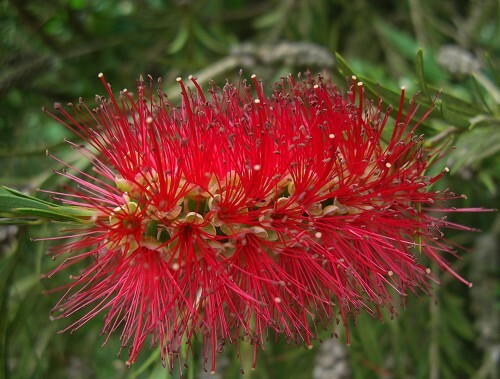 Callistemon citrinus will tolerate temperatures down to -5 degrees C so should be planted in a sheltered spot if there is a risk of temperatures lower than that. We occasionally experience lower temperatures here and those in our garden have survived. 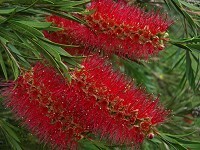 The leaves are long, narrow and leathery. 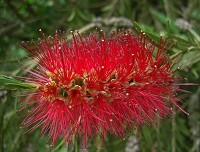 The flowers are made up of brush-like crimson spikes (5 - 10 cms long, which as the name suggests, look just like a "bottle brush". A pretty shrub during the few weeks that it is flowering.